I’m constantly reminding myself of the good fortune in having a selection of fairly good outbuildings at my disposal. They’re generally weatherproof most of the time with power and light available so they’re perfectly usable for my needs. 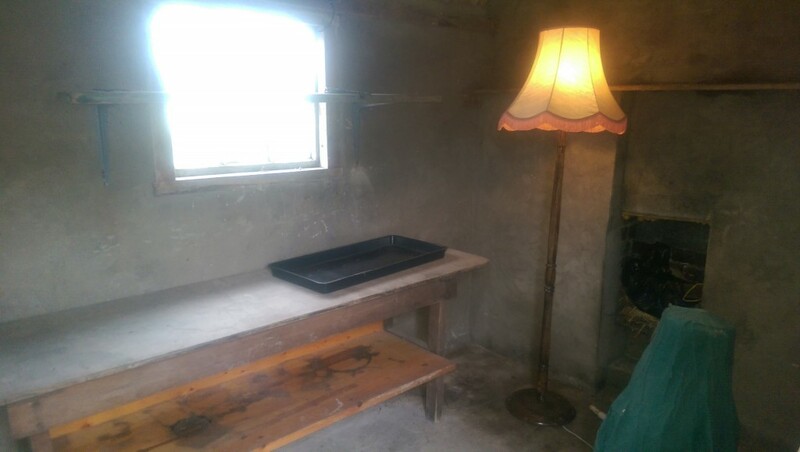 The problem I’ve had is that the original potting shed had collected more and more junk since we moved in – presumably following that well-known law of physics where junk expands to fit the available space. Later this year there will be other outbuildings to sort out which will mean a wider rethink on the usage for all of them. 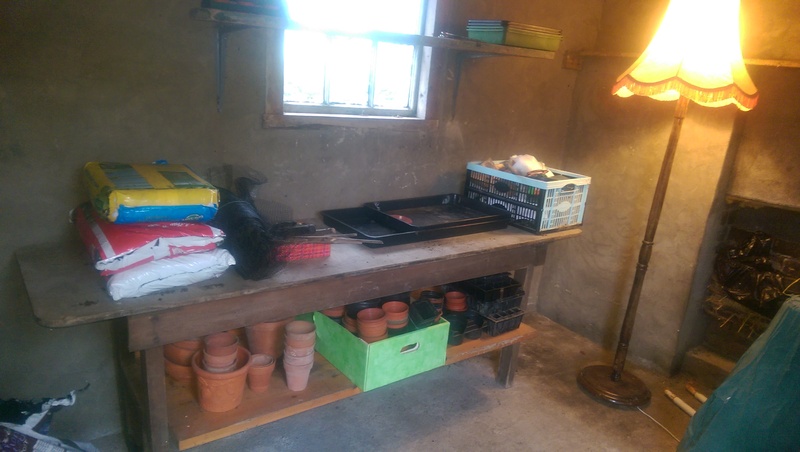 However the first step was to relocate the potting shed into a smaller space to exclude the junk and make it more convenient for the various raised beds scattered around the garden. Starting with a blank canvas certainly makes the job easier and once the first items are in place everything soon looks good. If I’m honest, I’ve never been particularly noted for my interior design skills but I was quite proud of how the space was working out. All started well enough and I felt that the standard lamp added a certain touch of class to the overall ambience. However once all the other “useful” items that I’m keeping were brought in, the space soon looked a little more crowded. Obviously you can never have enough plant pots and seed trays so they have to stay. Handy tray covers, bags of compost, netting and mesh covers are also pretty much crucial I think. I may need to rethink things in the near future because, although the picture below looks quite nicely arranged, there has been quite a lot more added since it was taken. It’s clear I wasn’t as efficient as I thought I had been at getting rid of the clutter. While I was wondering what to do with the large pile of left over, dried up old compost from past years, the one-eyed pet hen (“Adele”) volunteered to check it over and remove any unwanted edible (and inedible) items. 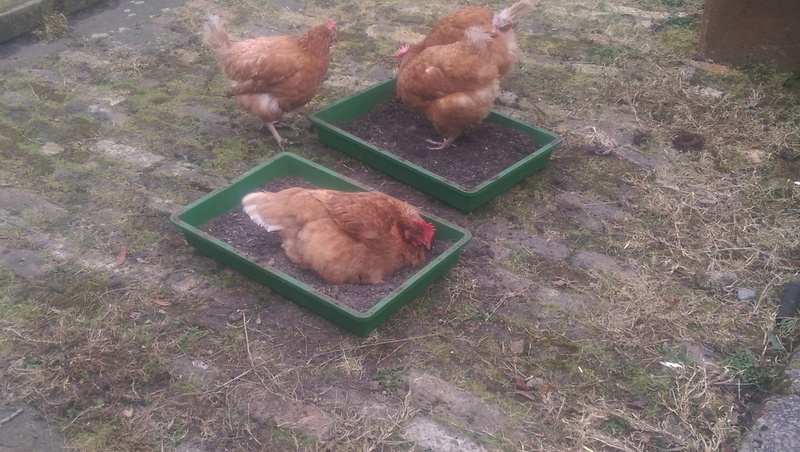 Given her example, it didn’t take the 3 rescue hens long to figure out what an opportunity this was.